Every once in a while a product comes along which revolutionizes the way that things are done. Sometimes it’s less costly than what was available before. Sometimes it’s faster. Sometimes it’s both. Whatever the innovation, the new product offers something that wasn’t previously available to the marketplace. 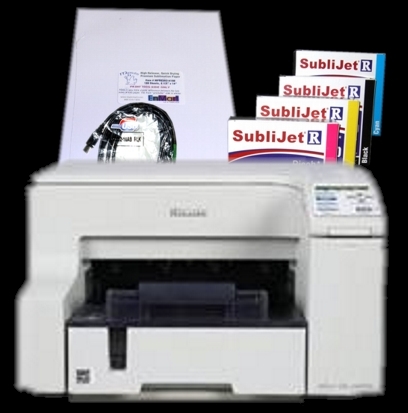 When it comes to sublimation, the Ricoh GX e3300N is that kind of product. EnMart in association with Sawgrass Technologies, is proud to announce the launch of the Ricoh GX e3300N for sublimation. This is a game-changing breakthrough for the sublimation printing industry, offering a unique combination of price, speed, reliability and extended uninterrupted printing capabilities. The Ricoh GX e3300N easily ranks as the fastest entry-level sublimation printer in the market, producing up to 144 color prints per hour. It is also one of the most economical printers in the industry. To allow our customers reap the benefits of this new printer, EnMart has created the QuickStartR Sublimation Package. This package, a $449 value, retails for $379. The package includes the Ricoh GX e3300N printer, 1 set (CMYK) of SublijetR ink, 1 pack of Mpress-II 8 1/2 x 14 paper, and 1 USB cable. EnMart will begin taking pre-orders for packages immediately. Packages are expected to begin shipping on March 1, 2010. Can i use my mac g5 if i put virtual windows on it, and would Hane t shirt maker work with the winindows format. Also Ive read conflicting things about the ricoh, one said it would work with mac, some say windows only. Thanks in Advance for your help. ← Have We Got a Sublimation Deal for You!